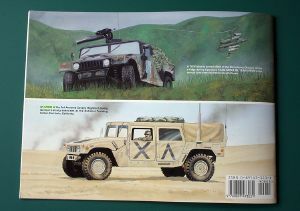 The 'Hummer/Humvee In Action" book is the 32nd publication in the Armor In Action series and it is quite old as it was first published eleven years ago in 1994. It has never been updated, so obviously it doesn't contain any information about any of recent conflicts where Humvees were used, like Bosnia, Kosovo, Afghanistan or Iraq. The book was printed in standard format for the series and this means 50 pages in 28cm x 21cm (W x H) format, 108 black&white photographs, some line drawings, color illustrations on the cover and color plates on two pages in the middle of book. No color photographs are included. Final chapter "In service" covers the use of Humvees in short text and in photo captions. Mentioned are various training exercises, and real combat operations of US Army and US Marines in Panama (Just Cause in 1989), Saudi Arabia (Desert Shield 1990-1991), Kuwait and Iraq (Desert Storm 1991) and also the use of Humvees by UNITA insurgents in Angola in 1990. The titles above are written exactly as they appear in the book. And this includes a spelling error ('supplimental'?...) and more importantly two incorrectly named variants: M988 in the first chapter should in fact be M998 and a TOW carrier (not 'Tow') is M966, not M996. M996 is an ambulance version and there is no such vehicle as M988. Unfortunately the book is full of similar errors... It is hard to say whose fault it is, author's or editor's, but someone trying to learn something about correct designations of various variants would be in serious trouble. The most common error is the use of M988 number instead of correct M998 and in fact the incorrect form is more often used in the book than the correct one! Another error that appears most often is use of M996 designation for TOW carrier instead of M966. I noticed that most errors are included in the main text, while photo captions usually contain correct information. This however doesn't mean that captions are always right. For example under the photo of soft-top M1035 ambulance we find information that it is "M996 soft top", while the main text correctly describes the M996 as armored Maxi-Ambulance. Another ambulance photo, this time showing M996 Mini-Ambulance is captioned as "Maxi-Ambulance". Illustrations and drawings are also not free from errors and one such example is illustration showing profiles of all armament carrier variants. On this drawing M1045 and M1046 vehicles are identical, because someone forgot to add a winch to the latter. Also on two color illustrations variants w/o winch are shown, but number for winch equipped versions are called in captions. I have also found some factual information in the book that seems to be a bit questionable or plain wrong. In the description of armament carrier variant we read that the weapons ring of TOW variants is larger than the ring of machine gun carriers. This is not true - the weapons ring is exactly the same in both variants and only fittings attached to it are different. The author uses the designation M1069 for the prime mover variant. I was not able to confirm that such number is used - it is not mentioned in any of Technical Manuals and is not listed on AM General website. This number appears on a couple of unofficial websites, but may well be copied from this book. In fact prime mover is usually a M1097 heavy Humvee with howitzer towing kit installed. There is a caption that says "the radiator is fitted with a special set of baffles that [...] provides protection form shrapnel and debris". This text is absolutely true for versions with basic armor, that have steel radiator grille, but the problem is that picture associated with caption shows fiberglass grille as fitted to soft-top Humvees. This type of grille can protect radiator from some debris, but shrapnel would go right through without even slowing down. I personally also don't like the simplified version of history presented in the introductory chapter. According to that text all light trucks used by US Army before the introduction of Humvee were 'Jeeps'. While it is true that all these vehicles were called 'jeeps' by troops, it is too big simplification to write about then like they were all the same. Besides, the Humvee is also called 'jeep' sometimes. The Ford M151 vehicles, while externally similar to earlier Jeeps were significantly different with their fully independent suspension and load carrying one piece body shell and they deserve more attention than just being considered as "another Jeep". Also surprisingly missing from the list of Jeeps used by Army is M38A1, quite important variant that saw service in Korea and Vietnam. What I found slightly annoying when reading the book, was the fact that author all the time uses the name "Hummer" for both civilian and military versions. While this name was probably indeed used also for military vehicles when they were still new, since civilian models become popular this name is no longer used by the troops. Now it is always a Humvee, to make a very clear distinction from the Hummer toys that movie stars drive in Hollywood. 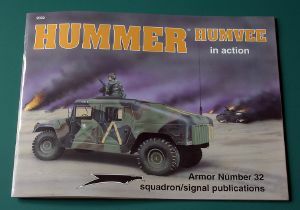 Of course the book is old, so the name Hummer may have indeed been still in use by troops at that time. The age of the book means that only early versions of Humvees are described. Upgraded A1 and A2 variants were introduced after the book was published and also some completely new versions were introduced since then, like uparmored M1114. 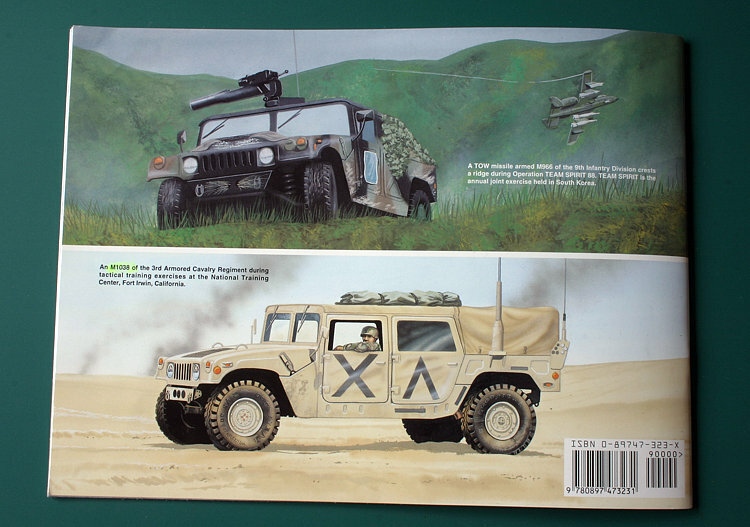 The only foreign users of Humvee mentioned in the book are Angolan UNITA forces, while today the vehicle is used by many other countries, sometimes in very interesting unusual variants and several countries used their Humvees in combat. Well, so far I provided a lot of negative comments about the book, but it absolutely doesn't mean that it is worthless. First of all the book is cheap and includes large number of good black&white photographs of early Humvees. Also most historical and technical information in the book is accurate and while it cannot be considered a solid reference, it still is interesting for anyone who wants to get general knowledge of Humvee and first years of its service with US forces. Despite many errors in text and its age, the book can still be useful for modelers thanks to a big number of interesting b&w photographs. It is just very important to remember that Humvees shown on photos are in various details different from those currently in service with US Army and Marines. It may also be a good idea to find some reliable source of information about designations of Humvee variants to avoid being mislead by the errors in the book. I think it is the high time for Squadron/Signal to publish an updated version of this book. Many thanks to MMD-Squadron for the review sample!